The Secretariat is elected by the PPN members, to be representative of the different geographical areas and the three pillars. It is an administrative body only, responsible for overseeing the day to day operations of the PPN. Find out more about the Secretariat here. PPN Representatives are members of the PPN who are elected to represent the issues of PPN members on a particular Board or Committee. 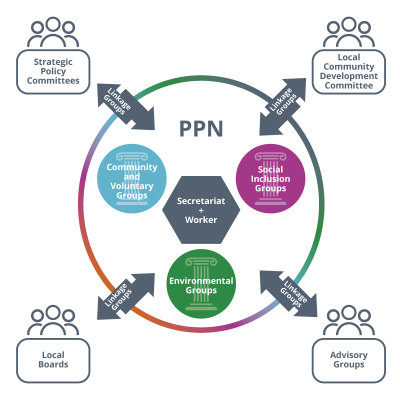 A PPN Representative does not represent the group they are a member of, they represent the PPN and are guided by their linkage group. Find out more about the PPN Reps here. Linkage Groups and Consultations are the way that PPN member organisations can have a real input into policy in their area of operation. Linkage Groups bring together stakeholder organisations with a common interest to discuss their diverse views and interests in a specific policy area. Find out more about the Linkage Groups and Consultations here.